Click on the link below for vendor information and application. All applications must be brought to the market for approval. 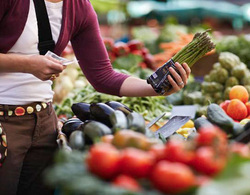 The Highland Park Farmers Market is designed to promote and provide opportunities for Nebraska farmers to market and sell fresh produce direct to the consumer. In addition the Highland Park Farmers Market also provides an opportunity for local Nebraska-based bakers and crafters to display and sell their value-added products direct to the consumers. The goal of the Farmers Market is to create a sense of community and promote a positive image of the historical and cultural heritage of Highland Park and the Museum.